There are a lot of choices out there for bed liners. Some truck accessory stores sell drop-in bed liners while some offer spray-in bed liners from a variety of companies. At Safari Truck & SUV Accessories in Jacksonville, we are proud to be an authorized Line-X installer. Line-X protective coatings are the best in the industry thanks to their specialized formula that is stronger and more damage-resistant than other bed liners. 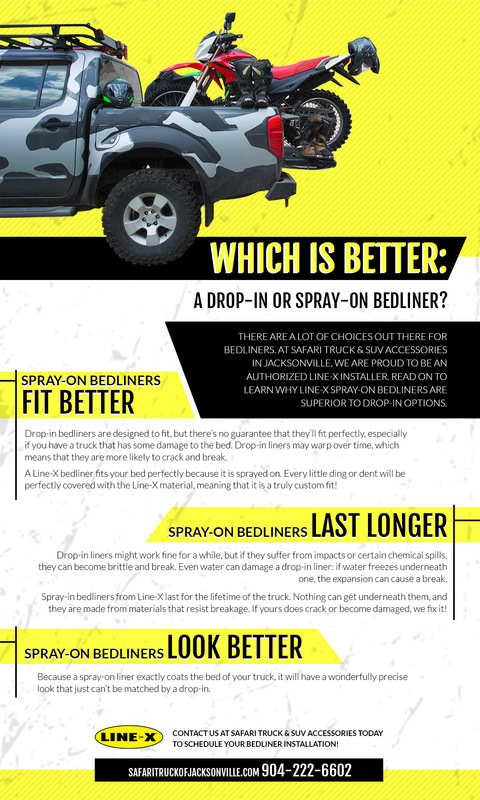 Read on to learn why Line-X spray-on bed liners are superior to drop-in options in every way. When you’re ready to protect your truck with the best, give us a call for a free, no-obligation quote on truck accessories! Drop-in bed liners are designed to fit, but there’s no guarantee that they’ll fit perfectly, especially if you have a truck that has some damage to the bed. Drop-in liners may warp over time, which means that they are more likely to crack and break. A Line-X bed liner fits your bed perfectly because it is sprayed on. Every little ding or dent will be perfectly covered with the Line-X material, meaning that it is a truly custom fit! 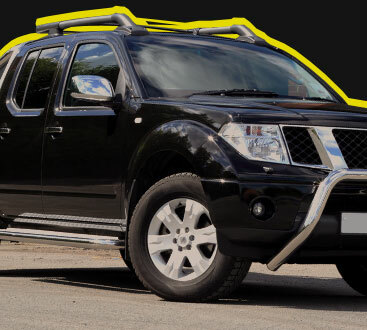 When you come to Safari Truck in Jacksonville, our expert installation technicians will apply the Line-X formula using the proper techniques and equipment to ensure that it looks great and conforms to your truck’s bed. Drop-in liners might work fine for a while, but if they suffer from impacts or certain chemical spills, they can become brittle, weak, and they may break. Even water can damage a drop-in liner — if water freezes underneath one, the expansion of ice can cause it to warp or break. 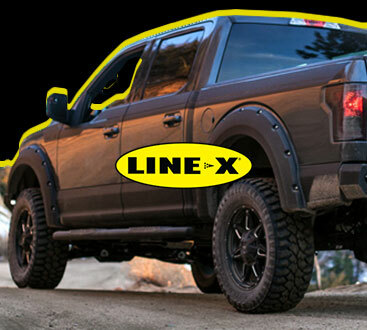 Spray-in bed liners from Line-X last for the lifetime of the truck. Nothing can get underneath them because the material bonds directly to the metal of the bed, and they are made from materials that resist breaking, crumbling, and cracking. If yours does crack or become damaged, we fix it, thanks to our lifetime guarantee. Line-X always stands behind their material because we understand just how strong it is. Because a spray-on liner exactly coats the bed of your truck, it will have a wonderfully precise look that just can’t be matched by a drop-in. Drop-ins look cheap and they also don’t guarantee that your bed will be protected from unsightly rust. If the seal of the drop-in liner isn’t perfect, water could get trapped underneath it. If there are any areas under the liner that aren’t covered by paint, it could cause rust. Contact us at Safari Truck & SUV Accessories today to schedule your bed liner installation! If you are looking for the best truck accessories, we can take care of that, too. We carry nerf bars, tonneau covers, grille guards, and a lot more. No matter what you are looking for, we probably have it! Give us a call today for a free estimate on the truck accessories and Line-X protective coatings that you need.